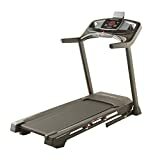 The ProForm Performance 400i treadmill allows for comfortable, safe and effective training sessions thanks to a large 51cm (20″) x 140cm (55″) running deck and features 10 incline levels that can be conveniently controlled through Quick Incline- keys. The machine is powered by a 2.5 continuous duty HP Mach Z- motor which can achieve top speed of 18kph (11.2mph) giving you the opportunity to test your stamina and exceed your fitness goal more efficiently, plus you can change the speed swiftly with QuickSpeed- controls. You can vary your trainings thanks to iFit® technology which ensures access to countless training programs created by professional trainers, or simply pick one of 19 programmes and instantly begin the drill with comfort and confidence. Furthermore, the machine has a clear and easy to read round Watts LED display providing you with constant feedback during training, and with Space Saver design it easily and effortlessly folds away for storage. In order to help you entertain yourself while exercising, the 400i includes a music port for iPod® or mp3 player, as well as an ergonomically positioned tablet holder. This entry was posted in Fitness Products and tagged 400i, Performance, Proform, Treadmill by Summer 365. Bookmark the permalink.